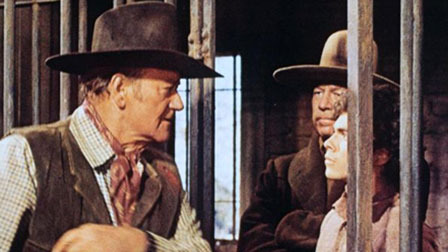 The late phase of John Wayne’s career was unusual because, unlike his contemporaries such as Henry Fonda and James Stewart, while he continued to make westerns as they did, some of Wayne’s were actually pretty good. While this is not the best of late John Wayne, it is not among the worst, either. J.D. 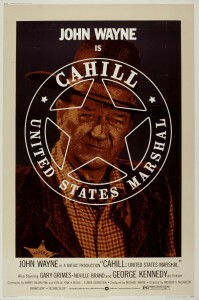 Cahill (an aging John Wayne) is, as the title has already told us, a U.S. marshal, based in Valentine, Texas. The drama comes because he has been, as a widower, a neglectful father, with his two sons (aged 11 and 17) growing up resentful of his constant absences from their lives. 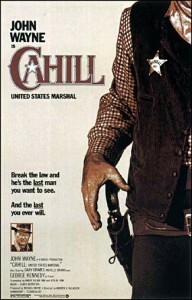 The movie opens with a scene where Cahill catches and brings in five armed bank-robbers single-handedly, establishing his formidable competence as a marshal. J.D. 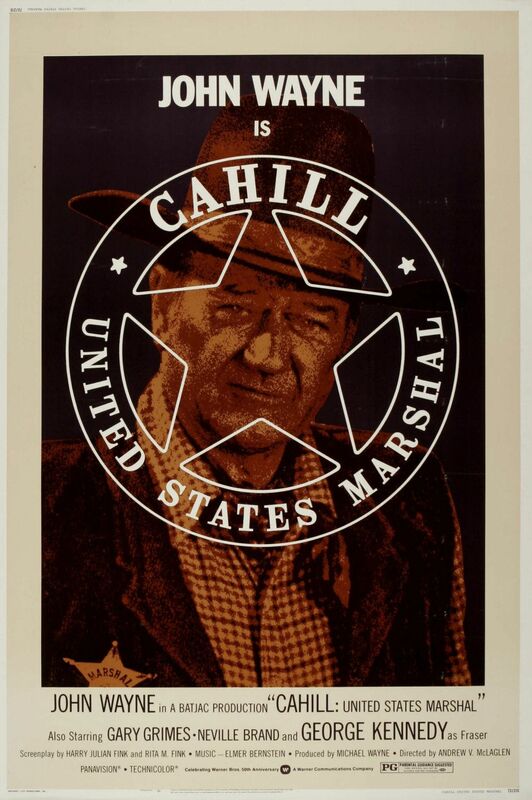 Cahill (John Wayne) is clearly nobody to mess with. Meanwhile, back in town, his older son Danny (Gary Grimes) has fallen in with bad company and has gotten himself thrown in jail with them to establish an alibi for a criminal enterprise. The younger son Billy Joe (Clay O’Brien) has also been enlisted in the plan, moving the tools into position, providing a distraction for the sheriff and others by setting fire to a barn, and taking and hiding the loot after the job. He lets the conspirators, led by Fraser (George Kennedy), out of jail, and they proceed to rob the bank, killing the sheriff and a deputy in the process. They get back into jail as if they’d never been out, establishing their apparent innocence. The boys, especially Billy Joe, have a tough time, since they’re not really hardened outlaws and were promised there’d be no killing. J.D. takes Danny and the half-Comanche Lightfoot (Neville Brand in dark makeup) in pursuit of the supposed robbers, and catches four of them. They seem guilty enough so they are sentenced to hang, although Danny knows they are innocent—of the bank robbery, at least. Cahill (John Wayne) is not pleased to find his older son Danny (Gary Grimes) in jail with questionable companions (George Kennedy). He may be lacking as a father, but Cahill’s instincts as a manhunter are at full strength, and he knows something is up with his sons. He and Lightfoot track them as they take the money from the robbery up in the mountains to meet Fraser and the others at a mine. They are shot at by the gang’s sentry; Lightfoot wounds him but is himself killed. The sons know that Fraser does not intend to leave them alive. Since we have already seen Cahill take on several bad guys at one time, we are not surprised when he does it again; it is well-staged. The sons take the loot back to town to return it, and it looks like they’ll arrive in time to stop the wrong men from hanging. (They should still need a good lawyer, although that isn’t addressed.) 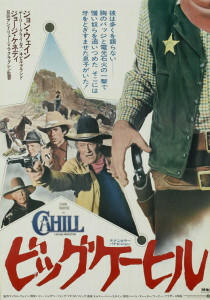 Cahill’s left shoulder is wounded twice in the course of the movie, but it looks like some repairs have been made to his relationship with his sons as well. Maybe the future will be better. The working title of the film initially was “Wednesday Morning.” Produced by Wayne’s Batjac production company, there are elements of this we’ve seen elsewhere. The faux-Indian figure (played by Howard Keel in The War Wagon and by Bruce Cabot in Big Jake) is here done best of all by Neville Brand, although he was never an actor of much subtlety. Elmer Bernstein had done many musical scores on John Wayne movies (e.g., The Comancheros), and elements of the music here seem recycled. Cahill’s invincibility seems a bit overdone, although it is a critical element of the story and certainly of the John Wayne persona. The large hairy outlaw who doesn’t speak much but is a vicious killer seems imported from Big Jake. Head bad guy Fraser (George Kennedy) is pretty scary to an eleven-year-old in the rain. 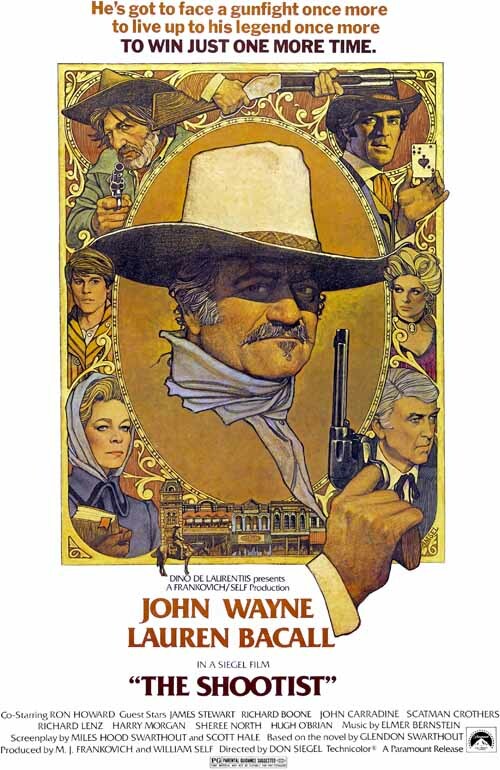 John Wayne is, well, very much John Wayne in this movie. His hats got taller during the 1970s, but he still looked convincing in a well-written part. At 66, he was not in good health, suffering from emphysema and the lung cancer that would kill him in a few years. Reportedly, he also had a few pangs about his own paternal neglect of his children over the years, which was partially addressed here by having one of them (Michael Wayne) as the producer. In the early 1970s, Gary Grimes specialized for a few years in coming-of-age stories, notably in Summer of ’42, but also in westerns such as The Culpepper Cattle Company and The Spikes Gang, and he wasn’t bad at it. 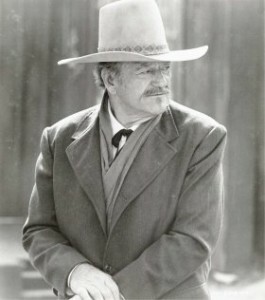 Young Clay O’Brien, who played the younger son, was an authentic New Mexico cowboy whose first acting job had been on Wayne’s The Cowboys the previous year. After a few years of playing small cowboys in movies, he went back to real cowboying, becoming a champion roper. Part of the fun here is seeing all the good character actors in bit parts. Royal Dano, Paul Fix, Hank Worden, Marie Windsor (once queen of the B movies), Denver Pyle and Harry Carey, Jr. all show up briefly here. 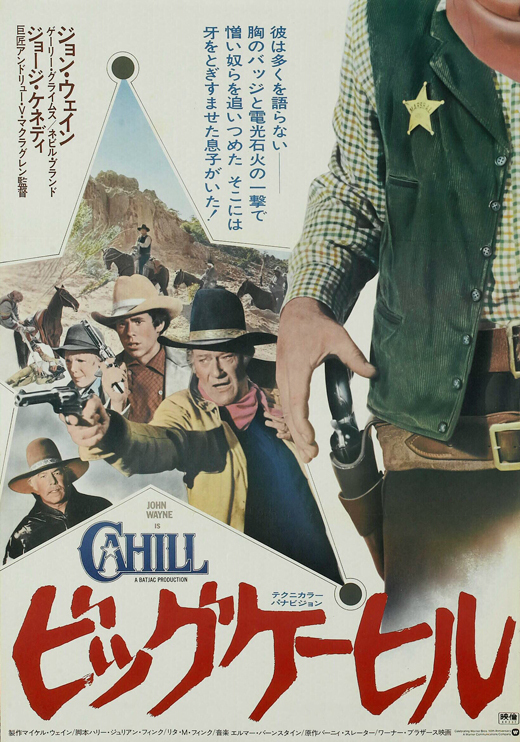 Even Chuck Roberson, Wayne’s long-time stand-in and stunt double, shows up on screen here; in addition to playing the head of a lynch mob, most of the medium-to-long shots of Cahill on a horse are actually Roberson. 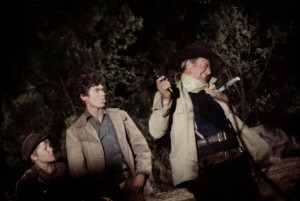 Cahill (John Wayne), here with sons Billy Joe (Clay O’Brien) and Danny (Gary Grimes), takes a knife to the shoulder in the climactic shootout. Director Andrew McLaglen had long had connections with John Ford and John Wayne through his father, actor Victor McLaglen. This was his fifth and final movie directing John Wayne, and as a movie director, McLaglen was a pretty good television director; that is, he never seemed to be as good as he should have been, given the resouces and talent he often had to work with at this stage of his career (see The Way West, for example). Screenwriter Harry Julian Fink and his wife Rita Fink had written Dirty Harry and Big Jake, and would go on to do a few more Clint Eastwood Dirty Harry movies. This movie is not the best of Wayne’s late career; The Cowboys, Big Jake and The Shootist (his last film) are all better. 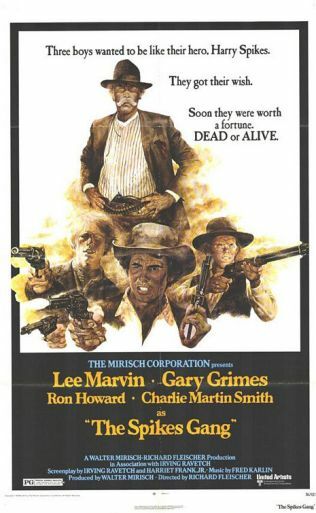 But it’s far from the worst, which would include the lamentable Rio Lobo and The Train Robbers. All in all, it’s worth watching, even if it sometimes seems like there’s less here than meets the eye. Shot in Durango, Mexico, in color, at 103 minutes. 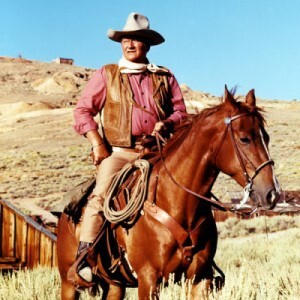 This entry was posted in Westerns Worth Watching and tagged Coming of Age Stories, John Wayne, Manhunts, The Search for Family on July 20, 2015 by Nicholas Chennault. Life in 1870 in Colorado Territory was apparently “nasty, brutish and short,” as in the well-known quotation by Thomas Hobbes and as depicted in this low-budget current western with a high body count. Young (16-year-old) Scotsman Jay Cavendish (Kodi Smit-McPhee) is out of his element, searching for his lost love Rose Ross (Caren Pistorius). A narrator (Silas, as it turns out) describes him as “a jackrabbit in a den of wolves.” The mood is set as the credits role over Jay riding through an Indian burial site. We are shown in a series of flashbacks how Jay’s uncle was accidentally killed in an altercation, causing Rose and her father (Rory McCann) to flee Scotland for the wilds of the New World. The flashbacks also reveal that Rose, of a lower social caste, does not think of Jay as a lover. What Jay also does not know is that a bounty of $2000 (very high for the time) has been posted on the Rosses, causing legions of distasteful bounty hunters to pursue them. 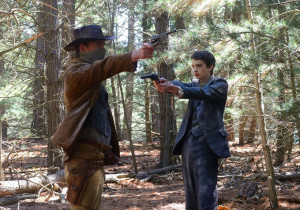 This is not as much a standoff between a masked Silas (Michael Fassbender) and a young Jay Cavendish as it would at first appear. As Jay gets closer to the Silver Ghost Forest (a name more allegorical than real-sounding) somewhere in Colorado, he is confronted by three ex-soldiers hunting Indians for sport, until he is rescued by Silas Selleck (Michael Fassbender), one such bounty hunter. Silas quickly and pitilessly dispatches the three, and Jay gives Silas his remaining money to get him safely to his destination. They arrive at an isolated general store, and spot another bounty hunter, dressed as a minister and carrying an elaborate rifle. While they are at the store, a desperate Swedish couple arrives and tries a hold-up. The storekeeper kills the husband, and, as the wife holds a gun on Silas, Jay shoots her. As they flee the scene, they see two blond children waiting outside the store. Sickened by it all, Jay sneaks away from Silas and falls in with Werner (Andrew Robertt), a man in a yellow wagon who appears to be a 19-century anthropologist “recounting the decline of the aboriginal tribes in the hope of preventing their extinction by their conversion to Christianity.” As Werner notes, “In a short time, this will be a long time ago,” showing a keen (and perhaps anachronistic) awareness of the transitory nature of the Old West. When Jay awakens the next morning, he discovers that Werner has departed in the night with his horse, clothes and possessions. 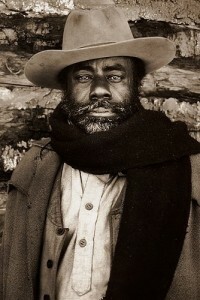 He stumbles across the prairie until Silas finds him and gives him back his horse and clothes. Silas denies having killed Werner for it. Chaperoned by Silas (Michael Fassbender), Jay Cavendish (Kodi Smit-McPhee) makes his way farther west. 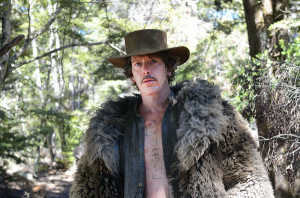 As they camp one evening, they are accosted by Payne (Ben Mendelsohn), who presides over a band of scurrilous bounty hunters and with whom Silas once rode. Payne plies them with absinthe, and Jay stumbles into Payne’s camp, noting that they appear to have the two blond children with them now. When Jay and Silas awaken the next morning in a downpour, they have lost their guns and most of their meager possessions. But they make it to the Silver Ghost Forest, and see the Ross cabin in the distance. Silas ties Jay to a tree to keep him from dashing into the situation. [Spoilers follow.] We see that the reverend/bounty hunter has arrived first, and he picks off John Ross. He is in turn blasted by Payne’s men, who lay siege to Rose and an Indian within the house. 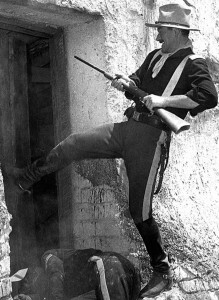 As Silas tries to help them without a gun, he is shot twice and rendered helpless. Silas, Rose and the Indian have reduced the number of Payne’s band, however. Jay finally gets loose and makes his way to the cabin, only to be shot by a shaking Rose as he enters. Payne finally enters as well and appears to have them at his mercy, but Rose slips a dying Jay her pistol and uses her body as a shield to give him the chance to shoot Payne. Payne (Ben Mendelsohn), leader of a pack of ruthless bounty hunters, in his impressive fur coat. As the movie comes to an end, we see Rose, Silas and the two blond children, apparently living as a happy family. It pans back over Silas’ killings that we saw earlier. Maybe all the bounty hunters are dead; if not, we have no idea why they are able to live so peacefully now. The title is curious but not inaccurate. This was written and directed by first-time Scottish director John Maclean, with a bit of a European sensibility. Sometimes the dialogue does not seem entirely authentic, as with Silas’ repeated “Let’s drift” when he’s ready to get going. Jay crosses the U.S. (or at least the western part of it) on horseback without a hat, which seems unlikely. The film does not always explain what’s going on, resulting occasionally in a slightly surreal feel, reminding us of, for example, Jim Jarmusch’s Dead Man—another tale of a stranger in a strange western land. Still, it is skillfully executed in its way and worth watching. Most viewers will find it more accessible than Dead Man. The siege at the cabin is well-filmed; it could easily have been very confusing with so many characters involved, but we can follow it well enough. Rose (Caren Pistorius) finds herself besieged by bounty hunters and surrounded by flying bullets. If the scenery does not always look completely like Colorado, that’s because this was shot mostly in New Zealand. It premiered at the Sundance Film Festival in January 2015, and was released in May. The twangy music by Jed Kurzel is very good. Excellent cinematography is by Robbie Ryan. In color, at 84 minutes; rated R for the violence. 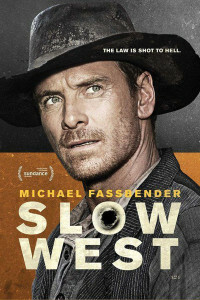 Irish actor Michael Fassbender is by far the best-known cast member, but all four of the main performers are excellent–Fassbender, young Kodi Smit-McPhee, Caren Pistorius and Ben Mendelsohn. For South African/New Zealander Pistorius, in particular, it may prove to be a breakthrough role, although she isn’t actually on screen much until the end. (Her name appears to be misspelled on one of the film’s posters.) Fassbender had a production role as well, which is why the film got made. If you have the opportunity, watch it twice; it will flow better the second time. 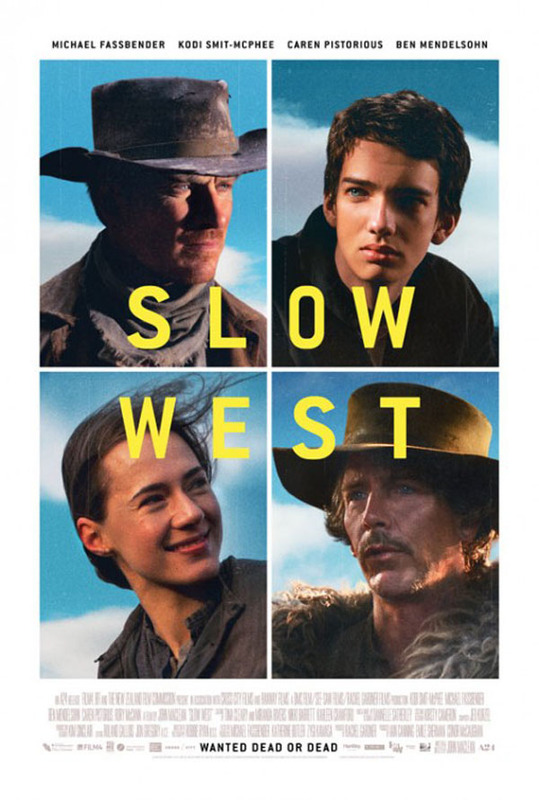 Poster for the UK release of Slow West, scheduled for late June 2015. 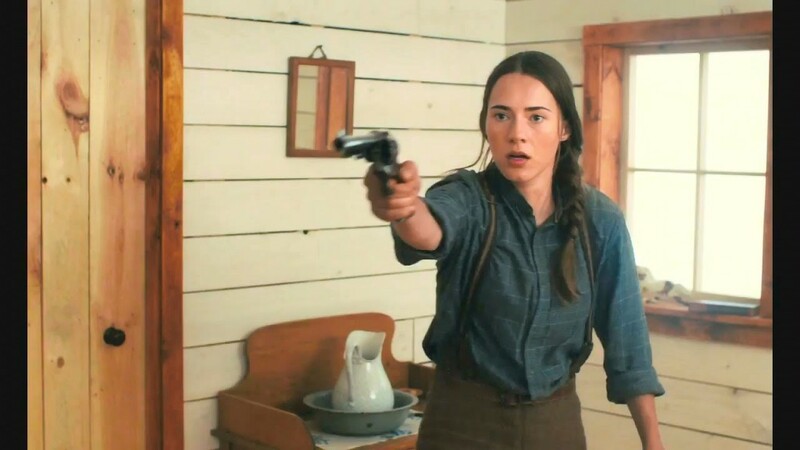 Rodrigo Perez in The Playlist was one of the more enthusiastic reviewers: “Brilliantly executed, Maclean’s movie is certainly an unconventional Western with a European and outsider’s perspective. 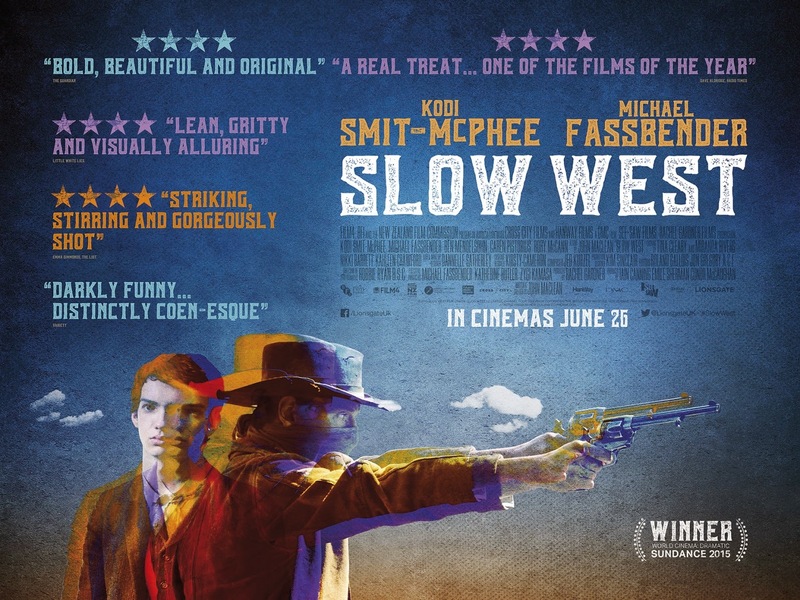 While it has its share of traditionally moody and atmospheric elements, Slow West is perhaps best defined by its sharp wit, absurdist violence and fairy tale qualities. Evincing a magic realism of fable dreaminess, juxtaposed with harsh severity, Maclean is right at home with this tone. This entry was posted in Westerns Worth Watching and tagged Bounty Hunters, Coming of Age Stories, Manhunts on May 23, 2015 by Nicholas Chennault. Neglected poor little rich boy Chester Graham, Jr., is the son of a railroad owner who never has time for him. 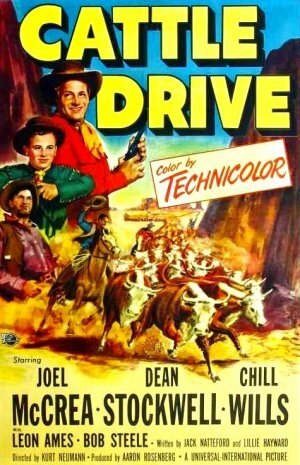 In a western desert, spoiled young Chester (Dean Stockwell) manages to get left by a train at a watering stop, and he wanders until found by Dan Matthews (Joel McCrea), who’s chasing wild stallion Midnight while on a cattle drive to Santa Fe. It’s a fairly conventional story in which Chet learns about people, responsibility, fairness and such while growing up a little bit on the trail. Color is lent by loquacious chuckwagon cook Dallas (Chill Wills) and responsibility by trail boss Cap (Howard Petrie) as well as Dan. Periodically, Dan and Chet pursue Midnight again, so Dan can start his own horse herd. They actually catch him once, but he gets away. By trail’s end, not only has Chet grown up some, but father Chester Sr. (Leon Ames) is trying to turn over a new leaf as a parent, too. Father and son go off with Dan to pursue Midnight yet again. There’s not one female role, although Dan shows a picture of a girl he hopes to marry in Santa Fe (the photo is McCrea’s real life wife Frances Dee, who never shows up in person). Even the bad-ish guy Curry isn’t very bad, so much as contrary. Shot In color, mostly in Death Valley. Pretty short at 77 minutes. Kind of like Cowboy, with an Easterner being taught western ways on the drive, and a lot like Captains Courageous, with a boy learning the ways of men. Not as complex as either, though. McCrea and Stockwell had worked together the previous year in Stars in My Crown. For Joel McCrea in another cattle drive movie from later in the 1950s, see Cattle Empire. For Joel McCrea and wife Frances Dee actually together on screen, see the underrated Four Faces West. 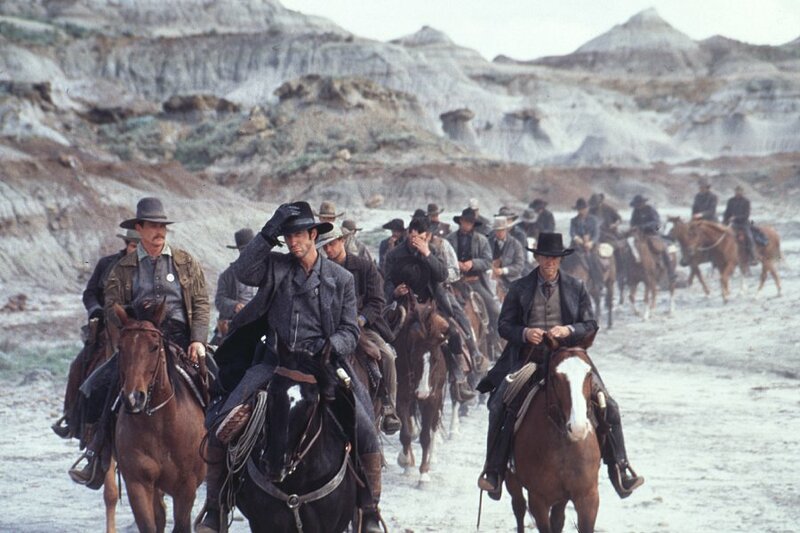 For cattle drive westerns generally, see our post Cattle Drive Westerns. This entry was posted in More Westerns and tagged Cattle Drives, Coming of Age Stories, Joel McCrea on November 3, 2014 by Nicholas Chennault. With a fairly good (youth-oriented) cast and excellent production values, this film suffers from poor direction and inadequate writing. It’s only 90 minutes long, and there’s not much flow to the story and not nearly enough character development. It’s 1875 in southern Texas. 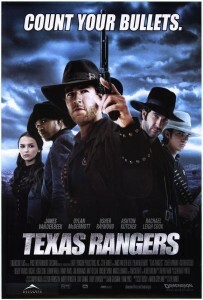 Consumptive Civil War veteran and former preacher Leander McNelly (Dylan McDermott, playing an actual historical Ranger captain) is somewhat theatrically digging his own grave when he is approached to form a new company of Texas Rangers to fight the huge outlaw gangs along the Rio Grande and the Nueces Strip, especially the ruthless semi-army led by John King Fisher (Alfred Molina). 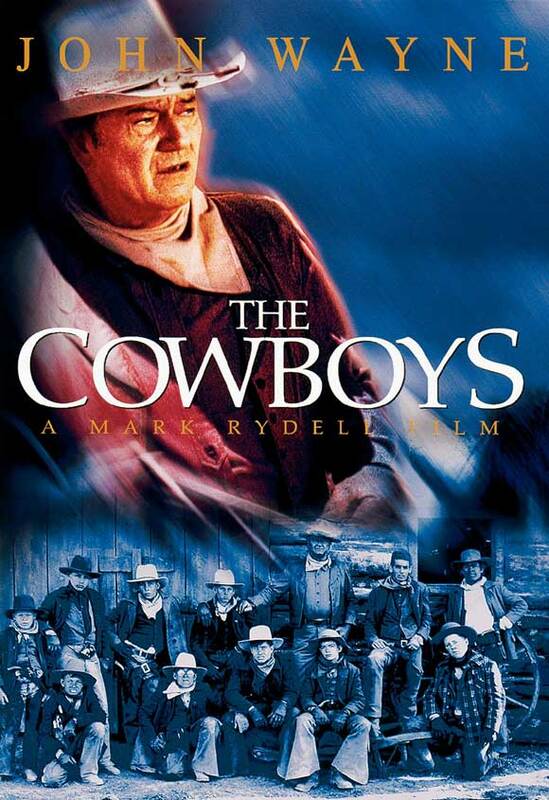 Captain McNelly has lost his own family to these brigands, and with a couple of experienced and faithful sergeants (Robert Patrick, Randy Travis) begins recruitment of a company of rangers in Brownsville. Signing up are a number of green youngsters, including educated Philadelphian Lincoln Rogers Dunnison (James Van Der Beek) and rough Missourian George Durham (Ashton Kutcher). Both of their families have been slaughtered by Fisher’s outlaws. This is intended to be a story of Dunnison becoming a man, but we don’t see enough of that story for it to be believable. He keeps a record of the expedition for McNelly and gets to know him. McNelly is as ruthless in his own way as Fisher, although he’s not gratuitously cruel. McNelly leads his company of 30 rangers in an attack on Fisher and is defeated by much larger numbers. Twelve of his rangers are killed, and they retreat to the large, prosperous ranch owned by Richard Dukes (Tom Skerritt) to lick their wounds and recruit more rangers. At the Dukes Ranch, Dunnison and Durham both are attracted to Dukes’ daughter Caroline (Rachael Leigh Cook), who inexplicably likes the feckless Durham more. Rescued female captive Perdita (Leonor Varela) says she overheard Fisher planning to attack the Logan Ranch, and the barely-recovered rangers head in that direction, only to realize that they have been misled and the real attack is on the Dukes Ranch. They double back but arrive at the devastated ranch too late and can only follow Fisher’s men with their stolen cattle to the Rio Grande. The rangers try to trade Perdita for the captive Dukes, but Fisher hangs him anyway. McNelly and his men follow Fisher’s outlaws across the Rio Grande to their Mexican stronghold and attack them there. McNelly is badly wounded, and Dunnison is saved by Perdita and kills Fisher. 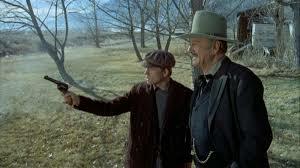 Back at the Dukes Ranch, the dying McNelly confers leadership of the ranger company on the young Dunnison, and they ride out at the end of the movie, presumably to continue cleaning out bandits and outlaws from the Rio Grande area. For the most part, the movie is well enough cast. Dylan McDermott is appropriately implacable and hard as McNelly; Alfred Molina is even more despicable than you’d expect a bandit chieftain to be. Van Der Beek, formerly known for the youth-oriented television series Dawson’s Creek, is fine as the city-educated Dunnison. 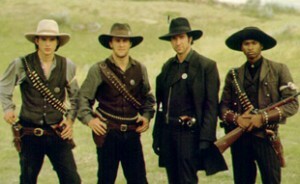 Other young elements of the cast are obviously influenced by the success of Young Guns some years earlier. Ashton Kutcher is just plain bad as George Durham, and Rachael Leigh Cook might have been all right if she’d been given a real role and any motivation or development. Instead, she joins a long line of extraneous and underused females in western movies. Usher Raymond is good as a young black scout with equality issues. Randy Travis isn’t bad, mostly because he doesn’t have to act much and has very few lines. James Coburn provides uncredited voice-over narration at the beginning of the film. The use of white armbands by McNelly’s men during attacks was historical. There are some historical inaccuracies as well, including the fact that Fisher rarely raided in the U.S and wasn’t killed until 1884 (with his friend gunman Ben Thompson). After his involvement with McNelly, Fisher became the sheriff of Uvalde County. More appropriate antagonists would have been the Mexican bandit chieftains Juan Cortina and Juan Salina. The weapons and use of dynamite are also inaccurate. 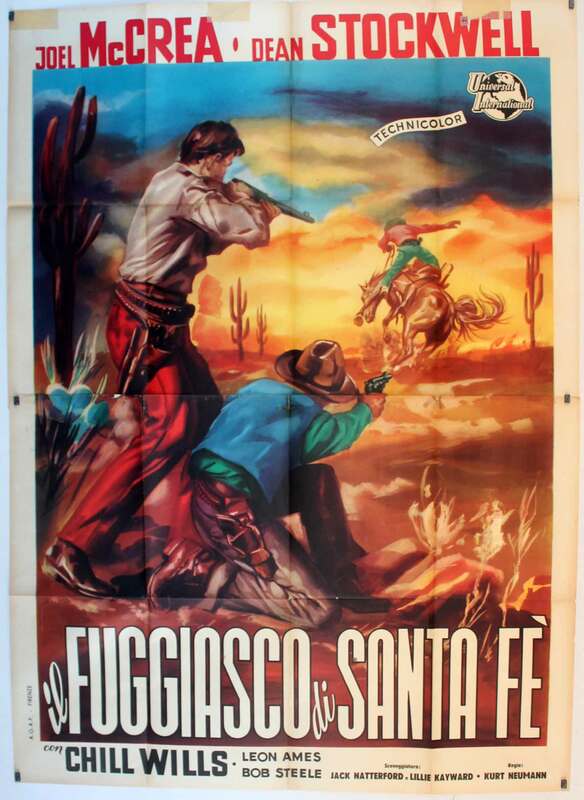 But for this kind of western, one expects more theatricality than accuracy. 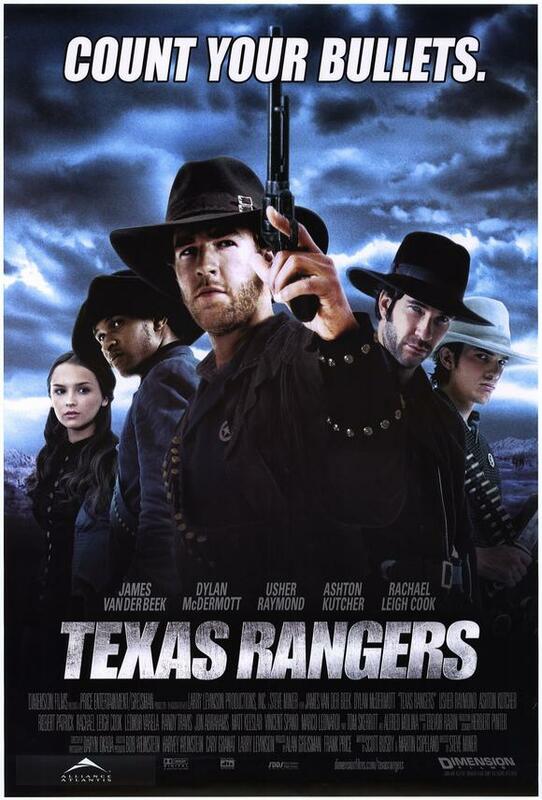 Photographs of real Texas rangers during the 1870s and 1880s show more sombrero-looking hats than those used in this movie. 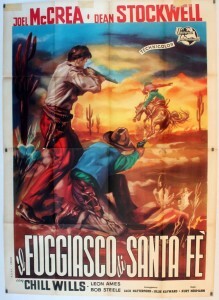 This film was apparently shot in Alberta, which, while beautiful, doesn’t look much like southern Texas. The bones of a good movie are here, but Miner and the various producers didn’t make one. They didn’t trust their writers enough to develop the various characters, and the result is a string of episodes where motivation and change are simply thrown in without being developed so we can care. Steve Miner, the director, is best known for such fare as Halloween and Friday the Thirteenth movies, and although those make money, they obviously didn’t prepare him for films that require more in the way of character and actual story. The Weinstein brothers are listed as executive producers; they know how to make movies, but they didn’t spend enough time or effort on this one. Or maybe they interfered too much. 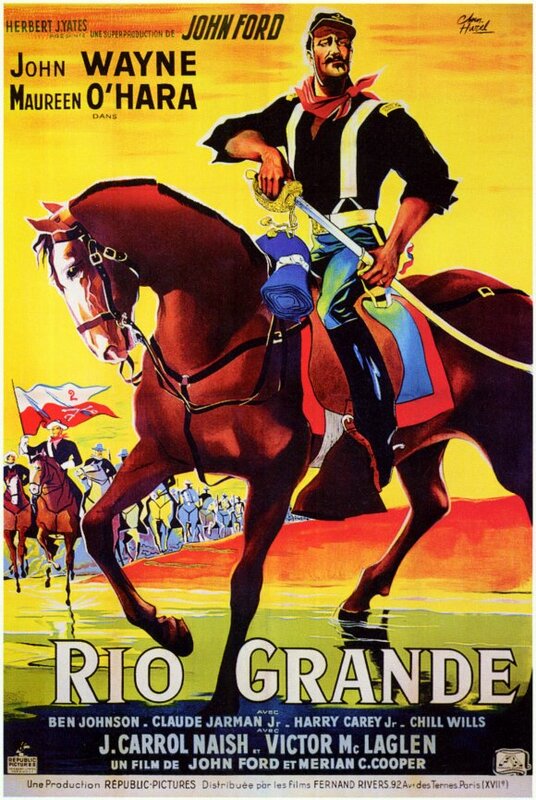 Compare it with American Outlaws, another attempt by some of the same people to use a youth-oriented cast to tell a quasi-historical western story. Both have a strongly anachronistic feel. Its theatrical release was delayed. It cost $38 million to make and made less than $800,000 during its theatrical release. This entry was posted in More Westerns and tagged Coming of Age Stories, Manhunts on December 24, 2013 by Nicholas Chennault. 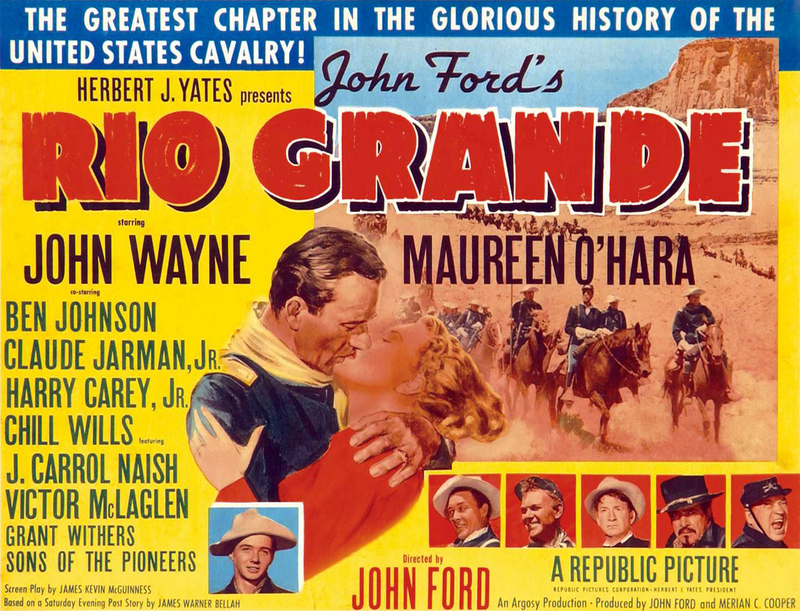 This is the last and the least critically-regarded of the John Ford cavalry trilogy. 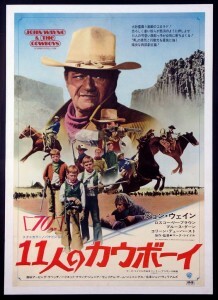 The story goes that Ford didn’t intend to make this film and only did so when the RKO studio head Herbert K. Yates told him they’d let him make The Quiet Man on location in Ireland if he made another cavalry picture with John Wayne first. 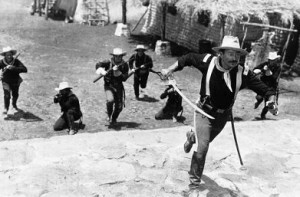 It had only half the budget of Fort Apache, the first in the trilogy, and according to Harry Carey, Jr., Ford and the rest of the crew treated the shooting as something of a vacation, although Ford was always responsible enough to get the film done if he wasn’t drinking too heavily. It’s also the first of five movies (with The Quiet Man, The Wings of Eagles, McLintock!, and Big Jake) pairing Wayne and Maureen O’Hara as romantic partners, an enduring screen couple. The story for this film seems more hastily put together than those for its two predecessors in the series. There is some confusion surrounding the individual movies in the trilogy, since names recur and the same actors show up in each film without any explicit connection. Even Wayne here has the same name as his character in Fort Apache, Kirby York, although it’s spelled York in Fort Apache and Yorke here. As in She Wore a Yellow Ribbon, Ben Johnson is a trooper named Tyree, although apparently not the same one. Victor McLaglen is Sergeant Quincannon again, and he may or may not be the same one. Harry Carey, Jr., is again a young soldier, although this time he’s an enlisted man from Texas named Daniel Boone. In any event, he’s never the one that gets the girl if there is one to get. It all leads to a sense of elements and names from the previous two movies by the same director being thrown into a hastily-crafted story here, with more overt sentimentality and the Sons of the Pioneers. Still of the Yorke family. Meanwhile, the soldiers’ principal military problem is the raiding Apaches, who who strike in the U.S. and then retreat into Mexico across the Rio Grande where Yorke and his men can’t follow them. A crisis comes when the Apaches capture a group of women and children from the military post and take them across the river. With the complicity of the visiting Phil Sheridan (J. Carroll Naish), Yorke risks his career to cross the river and rescue the captives, leading to a final battle in an Indian-held town with the prisoners being held in a church. 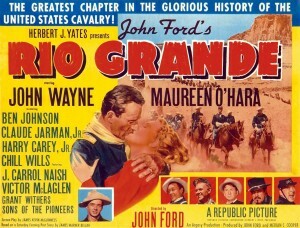 There is excellent chemistry between Wayne and O’Hara, leading to their pairing in four subsequent films. (The most sucessful of these pairings was probably The Quiet Man, a non-western.) A significant element of this chemistry is the sparks that fly from their disagreements, which may be why they frequently seem to play married but estranged partners. It works better here than it does in, for example, McLintock! O’Hara at 30 seems young to be the mother of a (more or less) adult soldier. 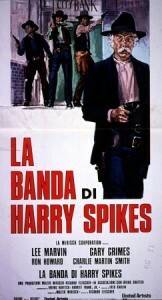 The supporting cast is good, although it contains many of John Ford’s usual suspects in their usual roles: McLaglen as the grizzled, alcoholic Irish sergeant who provides occasional comic relief that doesn’t work all that well for current audiences; Ben Johnson as the former Confederate trooper; and Harry Carey, Jr., as a green trooper or young officer. Chill Wills is good as the regimental surgeon. Even if the story doesn’t hang together as well as the previous two in the trilogy, the movie is nevertheless quite watchable. Col. Yorke busts down the door. Most of Ford’s films have a streak of populist sentimentality, and this has more than most. 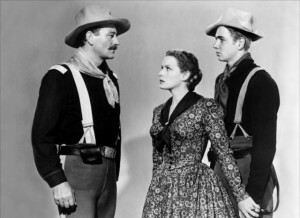 Some of that sentimental tone comes from the music, including traditional tunes and ballads provided by the Sons of the Pioneers (with one song even written by Dale Evans). The source material is also a common thread with the others in the cavalry trilogy, since they’re all based on short stories by James Warner Bellah. It was filmed in black and white, although a colorized version exists. Bert Glennon, who did Ford’s Stagecoach more than a decade earlier, was in charge of the cinematography, and you can see some of the technical and artistic advances in the decade between the two films. 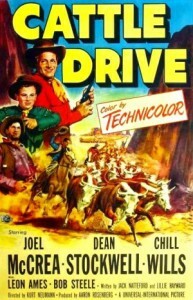 This one was filmed in the desert locations around Moab, Utah, not Ford’s usual Monument Valley in the Four Corners area to the south. 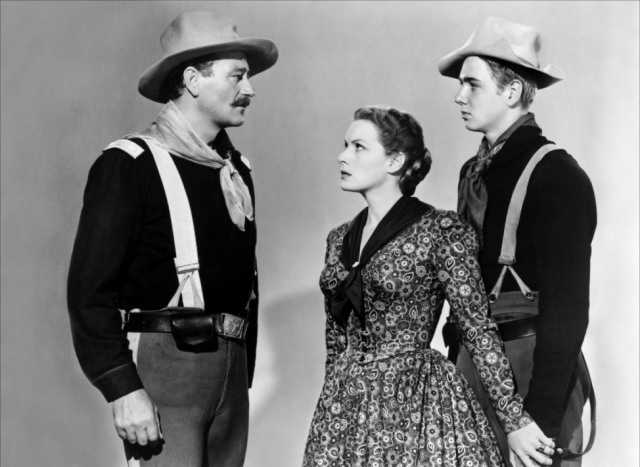 This entry was posted in 55 Greatest Westerns and tagged Cavalry Movies, Coming of Age Stories, John Ford, John Wayne, Maureen O'Hara, Native Americans (Indians) on September 25, 2013 by Nicholas Chennault. 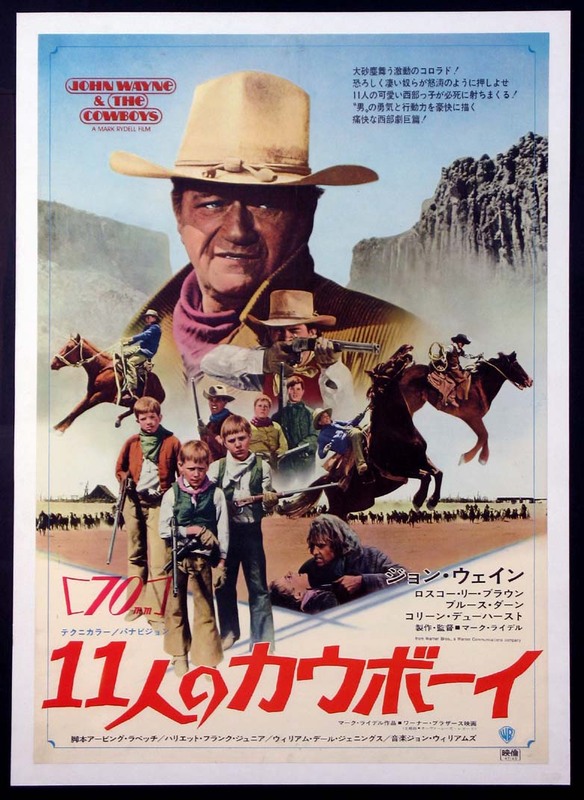 This is one of the two great cattle drive westerns starring John Wayne. The other is Red River, which admittedly is better and was more ground-breaking in its day. But this is excellent in its way and has aged fairly well in the more than 40 years since its release. 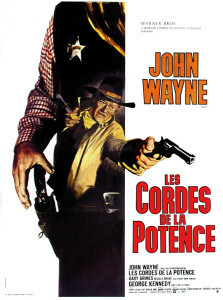 John Wayne carries this movie pretty much on his own; although the supporting roles are well-played, they are significantly smaller than Wayne’s. Andersen and his recruits (click on the picture for better focus). The emphasis in the title is on the “boys” part, although the cows are certainly present as well. Aging Montana rancher Wil Andersen (Wayne) finds himself without his usual help when it’s time to drive his cattle 400 miles east to market in Belle Fourche. 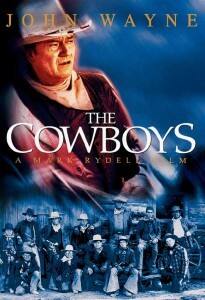 In desperation, he is forced to take on eleven young boys as his drovers, and it is a coming-of-age exercise for them. They encounter Colleen Dewhurst and her bevy of soiled doves, as well as rough men of questionable motives, as they do their growing and learn their trade. Like many other westerns (The Outlaw Josey Wales and The Shootist, for example), this one is also about the search for family and belonging. Andersen can offer them knowledge and opportunities they don’t yet have and becomes their hard-edged father figure; they become the replacements for his own dead sons. It all works. It was no secret when this movie was released that a John Wayne character would get killed for the first time ever in a western, or at least for the first time since he had become a major star (with the exception of The Alamo, of course). That provided part of the punch of the film on its initial release. 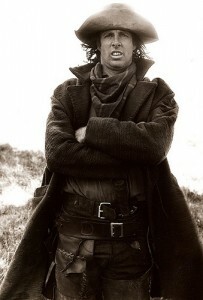 The rest of the impact was in the way it was done, by the near-psychotic villainy of Bruce Dern as Long Hair/Asa Watts. Wayne told Dern that everybody would hate him for the role; Dern said he responded, “Maybe, but they’ll love me in Berkeley,” a reference to distaste among some on the left for Wayne’s right-wing politics. When the movie was released in 1972, the country was still in the midst of a strong wave of anti-Vietnam war sentiment, and many thought that the way the rest of the movie played out after Anderson’s death glorified too much violence by boys too young. But that seems less of a worry on re-watching; a greater problem lies with incomplete believability in that sequence. Still, it’s a good movie, and an excellent western. Young director Mark Rydell (The Rievers, On Golden Pond) said he wanted George C. Scott for the lead role at first but was persuaded by the studio to go for Wayne’s surer box office clout instead, despite Rydell’s personal distaste for Wayne’s politics. It was a smart move. 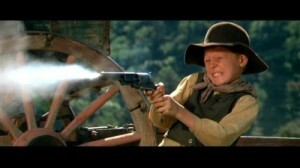 Although Scott was an excellent actor, he didn’t carry the same authority in westerns that Wayne did. 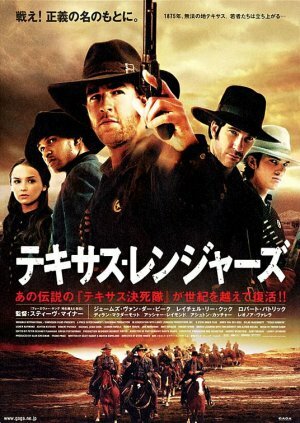 It’s a fairly simple plot, and the film takes its time getting things set up before the cattle drive actually takes off. But overall the movie’s pacing works well. It was shot in New Mexico with a lot of dust, textures, long vistas and beautiful mountains. The John Williams score is excellent, with a touch of some guy named Vivaldi. In addition to Dern’s wonderfully loathsome badness, Roscoe Lee Browne gives a strong performance as Jebediah Nightlinger, the drive’s cook and the first black man these young men have seen. 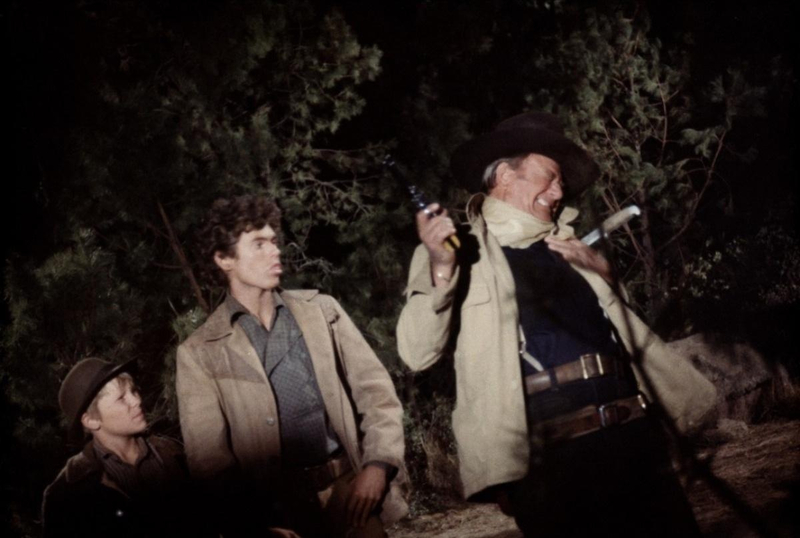 Browne plays Nightlinger with perhaps the most perfect diction and Shakespearean delivery ever heard in a western. Colleen Dewhurst is great in her brief role as the madam of a traveling group of soiled doves, and Sarah Cunningham shows a lot of character as Anderson’s wife. Richard Farnsworth is a member of Long Hair’s gang, a decade before he started getting meatier roles. Among the boys, A Martinez as Cimarron, the outsider (and the oldest), and the young Robert Carradine as Slim are particularly memorable. But the boys all make an effective ensemble. 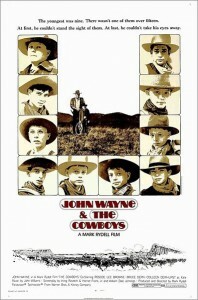 Five of them had experience acting, and the rest were from ranching and rodeo backgrounds. They work together well. 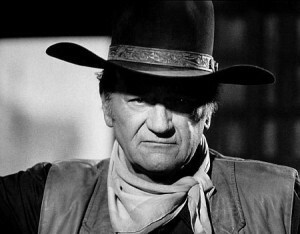 John Wayne had some strong performances in the last part of his career, from True Grit to The Shootist. 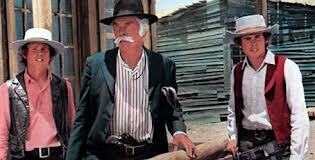 Along with those two, The Cowboys and Big Jake are memorable. Of course, he was in some duds as well, such as The Train Robbers and Rio Lobo. But that’s not a bad batting average. This entry was posted in 55 Greatest Westerns and tagged Cattle Drives, Coming of Age Stories, John Wayne, Outlaw Gangs, Richard Farnsworth on August 22, 2013 by Nicholas Chennault. Based on an Australian epic poem by Banjo Paterson, this is a young-man-triumphing-over-adversity-and-making-his-way-through-perseverance-and-force-of-character movie, set in the highlands of Australia. It’s also a movie for horse lovers. Tom Burlinson plays young Jim Craig, who’s trying to put together a respectable highland spread for himself after his father is killed in the movie’s opening scene. While working for the local ranching baron Harrison (Kirk Douglas), he meets, falls in love with and tries to win the baron’s daughter Jessica (Sigrid Thornton). Burlinson and Thornton are appealing as the young lovers. Douglas plays a dual role as both the baron and his estranged one-legged prospector brother Spur; he occasionally gives in to a temptation to chew the scenery, especially in the prospector role. Jack Thompson is good in a supporting role as Clancy, the legendary highlands horse and cattle man. Craig captures and domesticates brumbies (wild horses) in the Australian highlands, and he’s good at it. Based in more beautiful upland country than some Australian westerns, the cinematography is stunning, as are the chase scenes. The most memorable images are of Craig hurtling down almost vertical slopes in pursuit of the brumbies, barely under control and only a slight misstep away from breaking legs and necks. 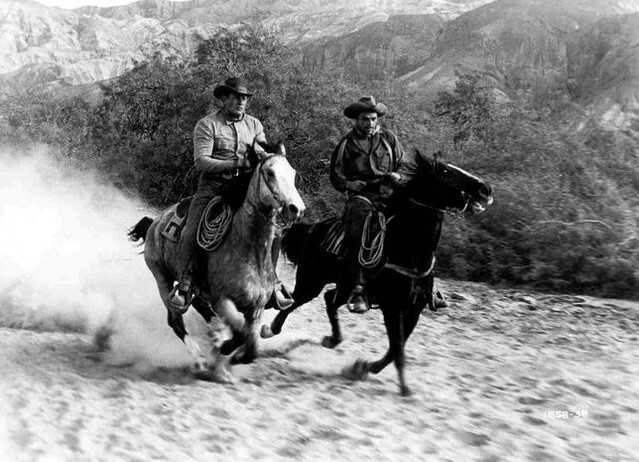 No other film has so successfully conveyed the joy of riding a horse full out, with the sense of speed, power and partnership. There’s a very Australian feel about the movie, with class conflicts and the underdog-makes-good story. 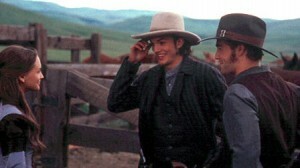 There are incidental conflicts between Craig and a couple of ill-meaning other riders, and with the over-proud Harrison. When Craig is sent to the highlands in pursuit of straggling cattle from the roundup, Jessica follows, only to be thrown by her horse and trapped on a cliff. Reading the physical signs of what happened, Craig finds and rescues her, and they fall more deeply in love. He completes the task and delivers the stragglers and Jessica back home; but he also encounters Harrison’s hostility to their relationship. Jim Craig (Tom Burlinson) rescues the heiress (Sigrid Thornton). A fiery stallion (the first “foal of Old Regret”) released into the wild years earlier by an angry Harrison is now the leader and protector of the highland brumbies. Now Harrison has purchased the last colt of Old Regret for £1000. Jim Craig tames it, but when he leaves it is allowed by troublemakers to run off with the brumbies. An enraged Harrison convenes all the riders in the vicinity; Clancy brings along Craig, who would otherwise not be welcome. 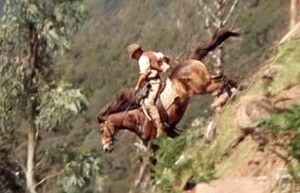 In the chase, the brumbies take off down slopes so steep riders can’t follow—except for Craig and his mountain-bred mount. 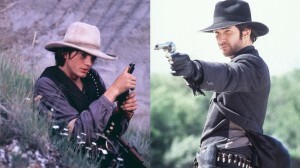 He brings them in and Harrison gets his colt back. Craig claims twelve brood mares and says he’ll be back for them “and whatever else is mine,” looking at Jessica. And that’s where the movie ends, without showing explicitly what happens to the young lovers or to the untamable leader of the brumbies. Hurtling down the hills, with no stunt rider. The basic plot is fairly ordinary, but here it’s done well. The movie’s beautiful setting in the wooded Australian highlands, decent acting, excellent cinematography and a good romantic musical score by Bruce Rowland make it quite enjoyable. The sight of riders in their Australian hats and flying coattails, with their drover whips cracking like gunshots, evokes a longing to be with them. Without much violence or harsh language, it has been characterized as a “family film,” but that is too limiting. The director is the Australian George Miller, but not the more famous Australian director of the same name who made the Mad Max movies and Babe. 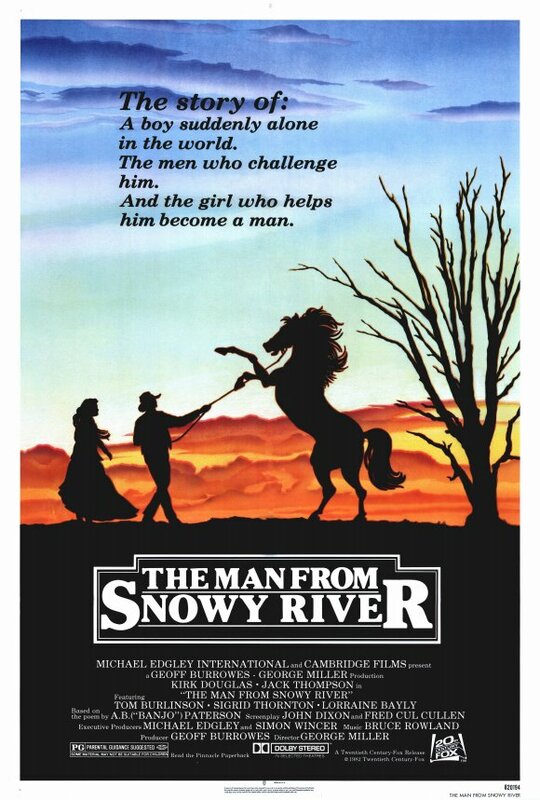 There is a passable sequel, Return to Snowy River (1988), which is a bit more formulaic but still watchable. Jim Craig’s highland homestead, built for the movie, became a kind of Australian national historical site until it was destroyed by wildfires more than twenty years later. There was a 1920 Australian silent movie with the same title based on the Banjo Paterson poem, but that is now considered lost. 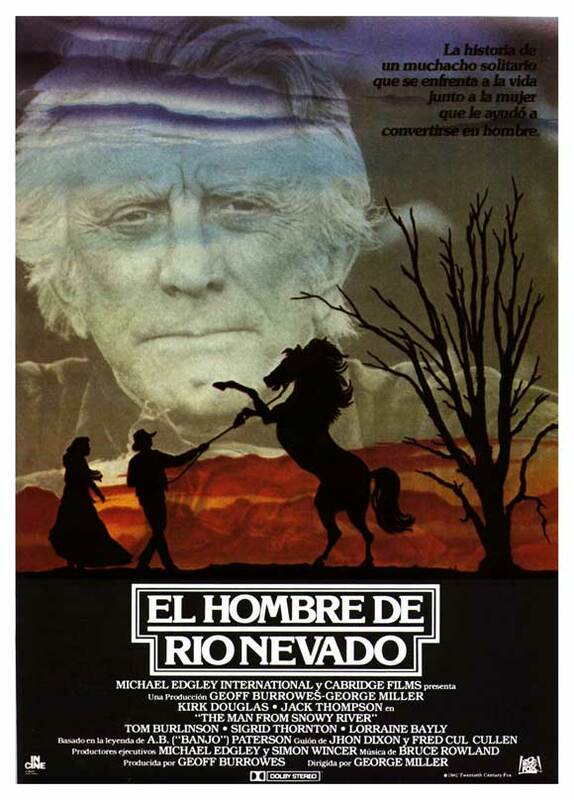 This entry was posted in 55 Greatest Westerns and tagged Australian Westerns, Cattle Drives, Coming of Age Stories, Kirk Douglas on August 14, 2013 by Nicholas Chennault.